Dickinson by Design is a small wood working shop located in the Green Garage in Detroit, MI. Our skilled crafts people hand make furniture pieces large and small with a focus on execution, finish, quality, and a respect for the natural beauty inherent in the materials we use. We are committed to a sustainable present and future on several different levels. Smith Shop is a dynamic craft-centric metalworking studio based in Detroit, Michigan. Smith Shop produces quality metalwork of all descriptions specializing in the custom fabrication of gold, silver, copper, brass and steel while also producing limited-production wholesale runs ranging from jewelry to architectural hardware. Reclaim Detroit’s primary focus is to divert as much material from Detroit’s 78,000 vacant structures from landfills as possible and will do so by using a process called deconstruction. By deconstructing homes instead of demolishing them, metropolitan Detroit municipalities, homeowners and communities all benefit from the positive results. 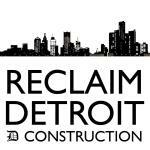 Reclaim Detroit is looking to change minds on deconstruction in Detroit. Currently materials are stored at its Focus Hope training facility and reclaimed wood is available for sale.